If you require sealcoating application and repairs the most important decision you will make throughout the process is selecting the best possible sealcoating contractor for your specific project. At Southbury Sealcoating, we approach each project we take on as a true professional; one who does the very best to ensure that your project is completed in the most efficient and cost effective manner possible. Our company uses only commercial grade high quality materials, which helps provide the best appearance, protection and overall results for your surface. 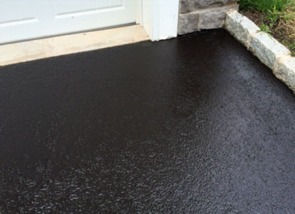 We are the Connecticut sealcoat professionals with the experience to provide each of our customers with the best prices without compromising service or quality. All of the work is done in a timely and proficient manner. Our scheduling is flexible and at your convenience. We have the capacity to handle sealcoating application and repair projects of all sizes and scope, from a single pot hole to a large commercial parking lot; we do it all! Extended Protection: Sealcoating will extend the life of the asphalt by forming a tough, durable coating protecting the surface from damaging elements of weather, salt, gas and other petroleum based products. Reduce Maintenance Expenses Sealcoating greatly reduces maintenance costs and at the same time extends the life of asphalt surface by as much as 300%. The overall cost is a minor expense in comparison to full replacement. Prevents Water Penetration: The intrusion of moisture into pavement accelerates the deterioration. Sealcoating prevents seepage from snow and rain preventing damaging freeze/thaw cycles. Reduces Oxidization: The sun’s rays can oxidize the asphalt oils causing brittleness, loss of material integrity, binders, and its deep, rich black color. An asphalt surface will resist the damaging degradation extending the life of the asphalt surface.